Performance on 20m is moderate, this is due to low elevation of antenna. 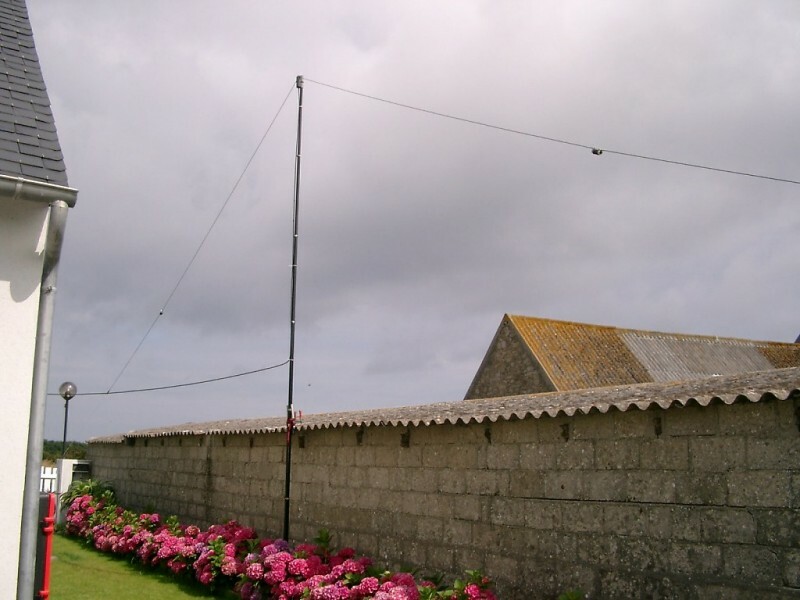 By experience, I have noticed that a 20m band dipole antenna must be elevated by at least 8m above ground to perform well ! There are at least to 2 or 3 S-points difference between a 20m dipole elevated at 3m and 8m ! See the EZNEC simulations below. A dipole has a nominal impedance of 73 Ohm, but at this height this will drop to 50 Ohm. No problems to operate over the full 20 and 40m with SWR < 1.5, so you will not need a tuner, if you adjust the antenna well. How to adjust the antenna ? Cut all wires + 20 cm too long and assemble the antenna, completely with traps. First adjust the 20m section, cut both ends carefully till resonance on centre of band. Then adjust the 40m section by cutting tail ends till best SWR at band centre. If the dipole is mounted as inverted-V with apex height @ 6m on a fiberglass pole, I observed lengths of 20m section of 5m20 and for 40m 3m25 (total = again about 8m45, wire section 4mm²) I used this antenna in the IOTA contest in 2007 activating EU-105 with good results ( see picture ). The idea was to make a high performance inverted-V for field day or holidays. 'High performance' means full sized elements on 20 and 40m, the best bands for DX and continental QSO's, and for 80m the antenna is shortened. This antenna has been used several times for IOTA activations. The inverted-V is supported by a telescopic fiberglass pole (e.g. Spiderbeam 12 or 18m. ), the apex can be at 8m - but optimal height (for 20m radiation) is at 12 to 13m. Don't forget to secure each element with adhesive tape (very temporary setup, not safe !) or adjustable circular clamps (with rubber protection). The 4 sections are mounted at 90° angles with respect to each other and provide guying for the pole. The feed is with a current balun. The 20m and 40/80m sections are simply fed in parallel, this does not deteriorate performances. The 40m section will as well resonate on 15m, on the 'high end' of the band. SWR is decent over the entire 15m and can be easily matched with transceiver built-in ATU, or matched by the PA finals, while the antenna is efficient. Performance on 15m, 20m and is 40m is excellent. Bandwidth is very broad on 20 and 40m, for 80m at least 100 kHz for SWR <1.5. For SSB and CW operation on 80m, cut the antenna for SSB and make 2 small 'tails' that can be added with banana plugs at the end of both legs. Remark regarding the wire diameter: I observed that, using a wire of dia 1.5mm² section, the length is longer than 4mm². For inveted-V 40/80m with apex 8m AGL, the 40m section will be 10m72, the 80m section 5m00.